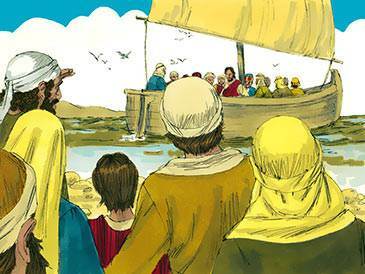 They answered, “Jesus is in that boat. We are going to meet Him.” Everyone who heard that hurried on with them. Jesus and His friends came to the shore. They got out of the boat and went up on a mountain. As they sat there they saw many people coming toward them. There would only be a very short time to rest. Jesus loved the people who were needy and followed Him. He felt sorry for them. Some were sick, and He cured them. Some longed to know how to be good, and He taught them. And while He taught and cured, the sun began to go down. Soon it would be night. Jesus said to them, “They do not need to go away. 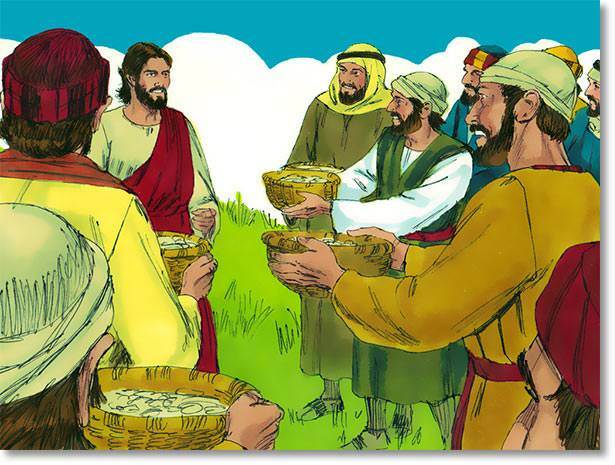 You give them food.” Philip told Jesus that it would cost a great deal of money to buy bread enough for each person to have only a little. Jesus could not bear to send these people home hungry. They had come a way out there just to be near Him. Oh, how sorry He felt as He saw how hungry and tired they looked! 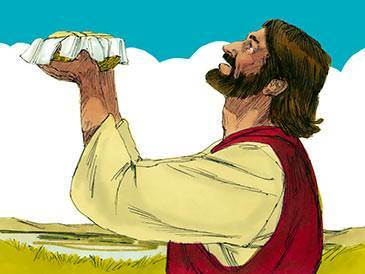 The boy gave all the food he had to Jesus—five small, round loaves of bread, like crackers, and two tiny dried fishes. This was his lunch. 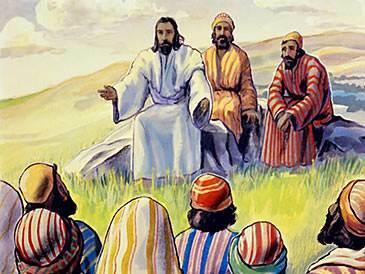 Jesus said to His friends, “Make the people sit down.” There was a great deal of green grass in this place. The people sat down on the grass in groups. This made it possible for those who served the food to walk where there were little paths of green grass. 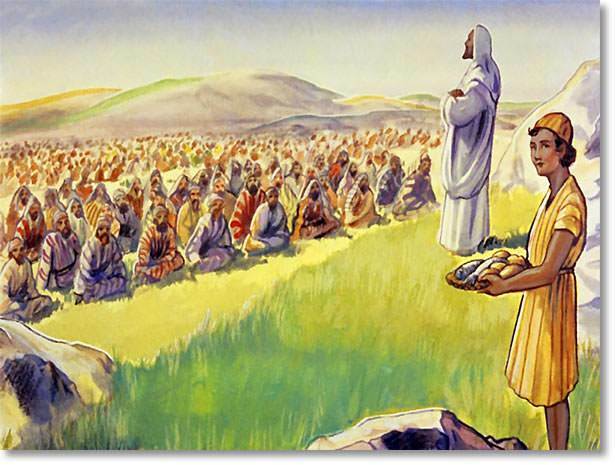 The friends of Jesus could walk in the paths to pass the food. But how much food would there would be to pass—only five small loaves of bread, like round crackers, and two fishes—only one boy’s lunch! 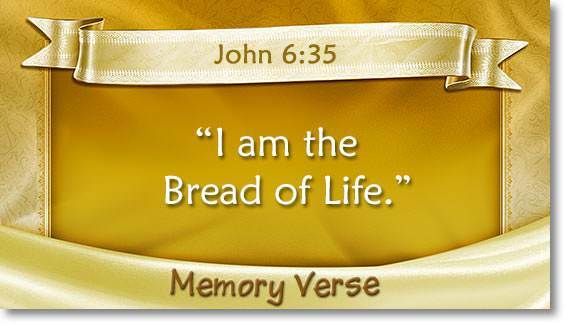 Jesus took the five loaves and the two fishes. When it was quite still He thanked God for them. 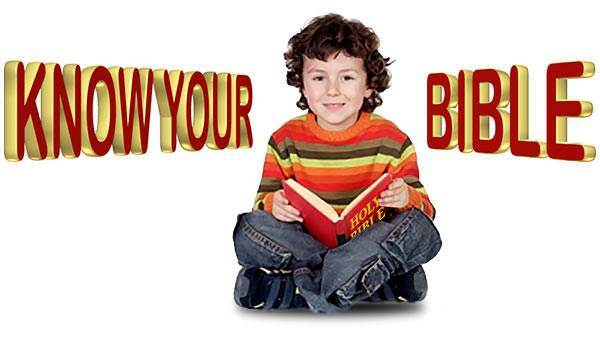 Then He broke the bread and the fishes in pieces and gave them to His friends, and they went up and down the paths, up and down between the garden beds of people, and gave them pieces of the loaves and fishes. When they had given all there was in their hands they came to Jesus for more. And there was more. 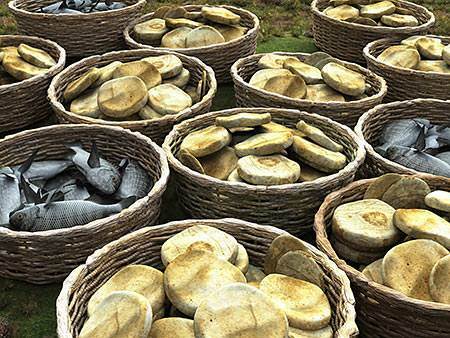 No matter how much they gave the hungry people, Jesus broke off fresh pieces of bread and handed them more fish. As I told you, there were crowds of people. There were more than you ever saw together. And every man and woman and child had enough to eat. The boy who had given up his lunch had all he wished. 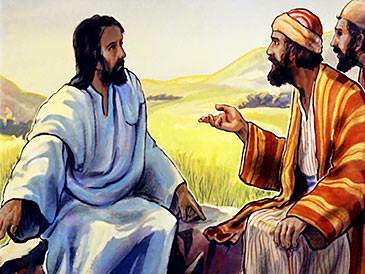 Then Jesus said to His friends, “Gather up the broken pieces which are left, that nothing shall be lost.” They went about and picked up the broken pieces of bread and fish. They put them in baskets. 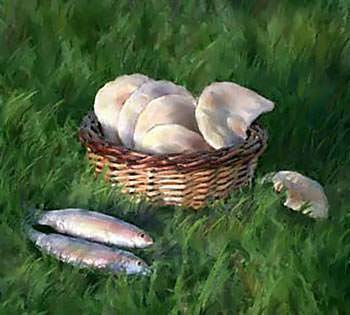 There were twelve baskets filled with the bread and fish that were left. The people did not look tired and hungry any longer. Jesus had fed them. 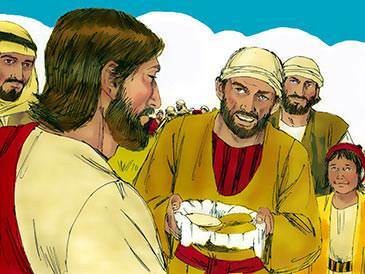 He had made the boy’s lunch of five loaves of bread and two fishes enough for all. The sun sank lower. The people were strong enough to go home now. Jesus had taken care of them.